Fink was born in Cornwall and grew up in Bristol. Fink's household was a musical one as his father was a folk musician and his mother was a music manager. As a teen and during his career's early years, Fink listened to house, acid jazz, Orbital and The Orb, which he described as a generational thing. He earned his degree in History and English in Leeds and signed with Kikin' Records, as EVA, shortly thereafter. Fink's musical background began with remixes, DJ sets and electronic hip hop. He also worked as a club promoter in London. Built around his bluesy voice, finger-picking acoustic guitar and the stripped-back live rhythm section, Biscuits boasted a fledgling pop sensibility while retaining the signature Ninja Tune vibe - a fact not lost on a swelling crowd of industry luminaries, notably Zero 7, who invited Fink to support them on their UK tour, and Nitin Sawhney, with whom Fink guested at the 2006 Electric Proms. A follow-up, entitled Distance And Time, was released through Ninja Tune on 8 October 2007, and featured the production work of Andy Barlow, formerly of Lamb. Lead track This Is The Thing was featured in one of Mastercard's Priceless series of television adverts, the 2010 film Dear John, as well as episodes of Friday Night Lights and Lie To Me. In 2006 Greenall, together with musicians Tim Bidwell (Hardkandy) and Elliot Richards (Heels Catch Fire) founded Folklaw Records - an independent record label based in Brighton releasing acoustic and underground artists. 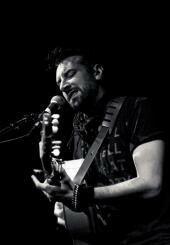 The first signing, Nikolas Barrell, was launched in March 2007 with the album The Gin Club. Fink appeared on Bonobo's 2006 album Days To Come for the track "If You Stayed Over", which he has consequently covered several times live with the band. Although Greenall has now taken a more acoustic singer-songwriter approach to his music, he also continues to DJ under the name Sideshow on Will Saul's Simple Records, with seven releases to his name. An album, Admit One, was released in January 2009. The fourth full-length Fink album, Sort of Revolution, appeared in May 2009, and features songwriting collaborations with John Legend.